Perhaps it might come as a surprise to the bi-coastal cultural types to find out there is more to San Antonio than the Alamo and a greater variety of available forms of amusements on a weekend evening than high school football. I am always so amused by the insularity of said bi-coastal cultural elites - and the naked surprise on their faces when they find out that high culture and the arts are very much appreciated, here in the wilds of fly-over country. Helllooo McNay Museum of Modern Art! Lets hear a shout-out for the Houston Grand Opera, going strong ever since the mid-1950s! And Austin - keeping it weird and arty for decades. Actually, there are many, many more outposts of high culture star-scattered all over the Lone Star State, but let's keep that our little secret, shall we? Otherwise, everyone would move in; that would quite take away the fun of our happy little enclaves and add an unbearable level of pretension to an event like . 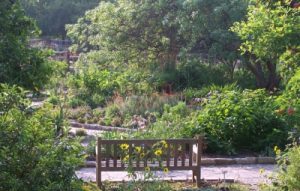 . . going down to the San Antonio Botanical Garden on a summer Saturday evening, as we did last weekend, with folding chairs, and blankets, bottles of water and insect repellent, shady hats and fans . 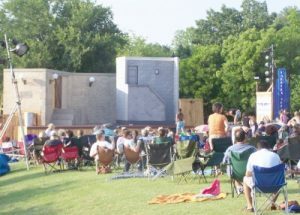 . . for Shakespeare In the Park. This is actually the second year that we have gone; last year, my daughter wanted to go - something to do with academic credit, I think - and it was unbearably hot, even after the sun set (which is when the performances begin) and there was a thunderstorm blowing in, lightening flickering clear on the horizon. 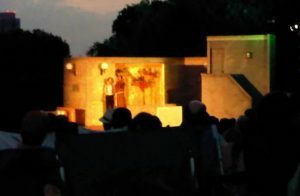 We were high on the hillside, overlooking the natural amphitheater where the stage is set up, and the lightening was a suitable backdrop for "The Tempest" - envisioned by the producers as taking place on an alien planet after a starship crash. Alas, the actor cast as Prospero kept forgetting his lines; cringe-making for the rest of the cast, especially as Prospero is supposed to carry the play, striding like Gandalf the White through the ruins of Minas Tirith. Seeing the oncoming storm, and fearing to watch any more theatrical humiliation, we departed during the interval - but this year, the presentation by the company of the Majick Theater hit the spot. 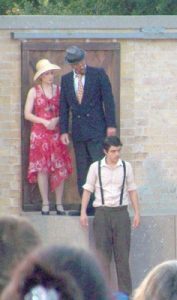 This time, it was Romeo and Juliet - with a local twist: the Montagues and Capulets being a pair of rival theatrical companies in 1929 San Antonio, with a Chief of Police, instead of a Prince of Verona, and the cast in full 1920's flapper dresses or shirts and ties with suspenders. Once one got past the odd conceit of rival performers going at each other with swords in backstreets and alleyways . . . and the oddness of hearing San Antonio, or ‘Santone' wedged in wherever Verona was named in the original text, it was quite tolerable, and the set was very clever; the stage-door of the Capulet's establishment revolved to show the inside of their house, and a sliding loading-dock door on the Montague side swung open to show the Friar's little cell. 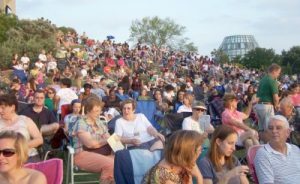 And this time- unlike last year - the hillside was practically standing-room only; a solid mass of people and folding chairs all the way from the edge of the stage to the top of the hill where the observation tower is. The only drawback to having a completely wonderful evening of it is that no outside food and drink might be brought in, which prevents one having a kind of lavish Glyndebourne Opera Festival experience, and kicking back to watch Shakespeare under the stars, assisted by a flute of champagne. Ah well, at least we'll always have Shakespeare and Majik.